Artisan's Market is a gathering that will showcase local, talented artists and craftspeople for a fun shopping experience. Our event will offer a variety of unique items to purchase, for yourself, your home, garden or a special gift. Mother's Day is just around the corner! Laurie is thrilled to be selected for the third time to display her artwork at the Cleveland Hopkins International Airport (CLE), Temporary Art Exhibition Program's upcoming exhibition "The Art Of Realism" Three pieces were submitted and accepted for this prestigious event. Location: The show will be on display along the entrance to Concourse A. come on by and check out the show. Many other talented artists will be featured! THIS IS THE ONLY VENUE SHOWING LAURIE’S WORK AT THIS larger 22” SIZE! and will be held in the CLE Terminal. Check back for further information. What an honor to have representation in this years juried Bay Arts Show! Laurie is honored to be selected out of over 500 pieces to display her artwork at the Bryn Du Mansion. The village of Grandville OH has a 15 year history with this prestigious event. The Artist Reception will take place on Tuesday, March 5, 2018 from 7 p.m. - 9p.m. The 17th Annual Nature Art Fest, featuring unique items inspired by nature from 25 professional artists, will be held at Wolf Creek Environmental Center. From paintings to stained glass, you'll find unique holiday gifts for everyone on your list. Bring the family and spend the day in one of the most beautiful parks in Medina County. Laurie will have a good selection of her art available for purchace in time for your holiday shopping! Saturday, November 10 -1 0 a.m. to 5 p.m.
Sunday, November 11 - 12 to 4 p.m.
Laurie is thrilled to be selected for the second time to display her artwork at the Cleveland Hopkins International Airport (CLE), Temporary Art Exhibition Program's upcoming exhibition "Black & White." Three pieces were submitted and accepted for this prestigious event. The Artist Reception will take place on Thursday, October 18, 2018 from 4:30 p.m. - 6:30 p.m. and will be held in the CLE Terminal. Check back for further information. Laurie, again has been accepted into the High Arts Festival! The visual arts portion of the festival will be held at Summit Artspace on East Market. Showing for the first time “Content”-snowleopard! THIS IS A PEOPLES CHOICE EXHIBITION! PLEASE VOTE! The exhibit will run through Saturday, October 6, 2018. Gallery hours are Thursdays and Fridays from 12 until 7 pm and Saturdays from 12 until 5 pm. The show will be open for extended hours during Akron Artwalk on October 6 from 5 – 9 pm. At the the finale reception and awards presentation on Oct. 6 from 8-10 p.m. This night a total of $32,000 will be distributed to winners that are decided by public and juried votes. Looking for closing night information? Head here. The High Arts Festival app is available for free from the Google Play Store/iTunes Store. Through the app, you can register to vote, explore all of the entries and vote on your favorite art, music, film and literary work throughout the event. Gallery Plus is located in the contemporary 78th Street Studios. Laurie’s ‘Dinner On The Go” was selected as a one of 10 finalists in the “Strength” show. This is a Peoples Choice event! Come out and vote! 2018 marks the 31st Service to the Arts Celebration! Each year, the Medina County Arts Council Trustees honor well respected and deserving individuals and organizations in the community for their passion, efforts and commitment to the Arts in Medina County, during a delightful summer evening of wine, delicious hors d’oeuvres from Medina restaurants, entertainment by local artists, a fundraising auction. Laurie was honored to be asked to display her art and to share her process during the event. The "Best of the Best" exhibition featured past award winners over the last three years of Creative Space Avon exhibitions including Renata Schmidt, Bill Naiman, Mike Rosa, Will Slabaugh, Julie Cook, Judy Medina, Stephanie Ramser, Chris Young, Chris Keener, Pam Esch, Kelly Shreve, Laurie Musser, Elia Pestrana Knight, Marcello Mellino, Lisa Edwards, Joyce Jones, Grisselle Chock, Denise LaVelle, J. Allen Lindner, Kelly Jadach, Beth Muellaurer, Lenny Putz, Dawn Hopkins, Dan Pruitt, Kerry Kuehn, Jack Koch, Brenda Johns, Judy Kean, Keith Peecook and Holly Pratt. Medina County Art League sponsors revolving themed shows at the Medina Country Club. As an Art League member Laurie participated in this event entitled PORTRAITS showing “Intent”-Sadie drawing and “Bentley”- Cocker Spaniel drawing. Stop in a n see some beautiful pieces and maybe commission a portrait for yourself or a friend! Following a successful Artfest at Wolf Creek, Laurie was asked to create a display of her work celebrating nature. Laurie shares twenty four pieces of her work. All works are available for purchase. 2018 The Urban Orchid-Solo Show! THRU? This show is a solo exhibition featuring twenty six pieces of Laurie work! Large and small, even some kitchen flour-sak towels! Stop in and say “Hi” to Jeff and Brandon! Who knows?..you may even find a reason for a new floral arrangement! These guys are the BEST! All items are available for purchase. This show features two of Laurie’s more recent pieces created specifically for this event! “The Gatherer” sold to the owner, THANKS JUDY! Berea Fine Art Club is currently located in the ‘Little Red Schoolhouse’ in Berea, OH. The Anniversary Show is open to the public and helps to raise funds to support the club’s community outreach efforts. Stop in and pick up original art pieces, photographs, jewelry, pottery, iron works, garden pieces, decorated eggs, etc. for Mothers Day! As part of the club’s membership, Laurie displays pieces regularly and is involved in various special events. Creative Space Avon is the only Art Gallery in Avon solely devoted to the exhibition of diverse works of art representing a wide range of artists. “Precious Moment” wins a Second Place! I am honored to be accepted among such amazing talents! My “Dinner On The Go”- Bald Eagle and “Mountain Reveille”-Bull Elk will be on display with “Dinner On The Go” winning Honorable Mention! I am thrill to be included for the first time in this amazing show! Worth the trip if you are not local! The Bath Church presents outstanding artwork from nearly 200 regional artists in all forms of media and celebrates the joy artists bring into our lives. Many pieces are for sale. Join Laurie and the Akron Zoo for this one-of-a-kind shopping experience. Stop by the booths of local vendors, and shop in our gift shop for all of your holiday needs. Akron Zoo members receive 20% off their gift shop purchases and a raffle ticket for every $10 spent. The Akron Zoo is not open during this event. The annual "Beck the Halls" ArtsMarket returns in December 2017 and will be on display thru January 2018. New this year for Laurie, this festive event features several artists working in a wide range of styles and mediums who have created works for you to discover -- and bring home this holiday season! Find creative, one-of-a-kind gifts, while supporting local artists. Come visit Laurie's table at the beautiful Wolf Creek Environmental Center! Come out for the day and visit Laurie at her booth as well as many other artisans in love with nature! Find beautiful, one-of-a-kind gifts for all the nature-lovers on your list. and all booth fees support The Wilderness Center’s education department. Support our local artists and provide educational opportunities for our community by shopping at NatureFest! During your visit, be sure to check out our amazing raffle prizes and feed your sweet tooth at our bake sale. This is a quaint place hosting regular wine tastings and displaying local artists' work. Laurie was asked to provide her artwork for the months of September and October 2017. The last day to see the show is Oct 28! Come on by and say hello to Mike and Kari and learn a bit about wine while taking in the beautiful artwork! This is the first time being accepted to this venue! Laurie will be featuring eight pieces! All black and white drawings 4-22x22" and 4-22x15"
to exhibit their collections of original artwork and photography in the airport. Submissions are reviewed by an Artists Review Panel. The duration of this exhibit is six months. Artists will be featured at the art site as well as on the airport’s website. 2017 at Cleveland Metroparks Watershed Stewardship Center at West Creek Reservation. Laurie will be exhibiting in this show along with many other area talents. Come spend a relaxing afternoon in the shade at the Harding Covered Bridge in Olmsted Falls. Laurie will have a table set up along with many other talented artisans! Art On The Bridge sponsored by the Berea Fine Arts Club. Show held at the The Harding Covered Bridge/Olmsted Falls, next to the Olmsted Falls Library. A fine arts show, free admission, music, and food. Time will Tell- A Show of Artistic Wisdom and Experience which will feature artists at least 50 years of age residing in the United States. This exhibition will culminate in a collection of works that embody the creativity and innovation of artists at all levels of artistic endeavor. The exhibit runs from June 30-August 13 2017. 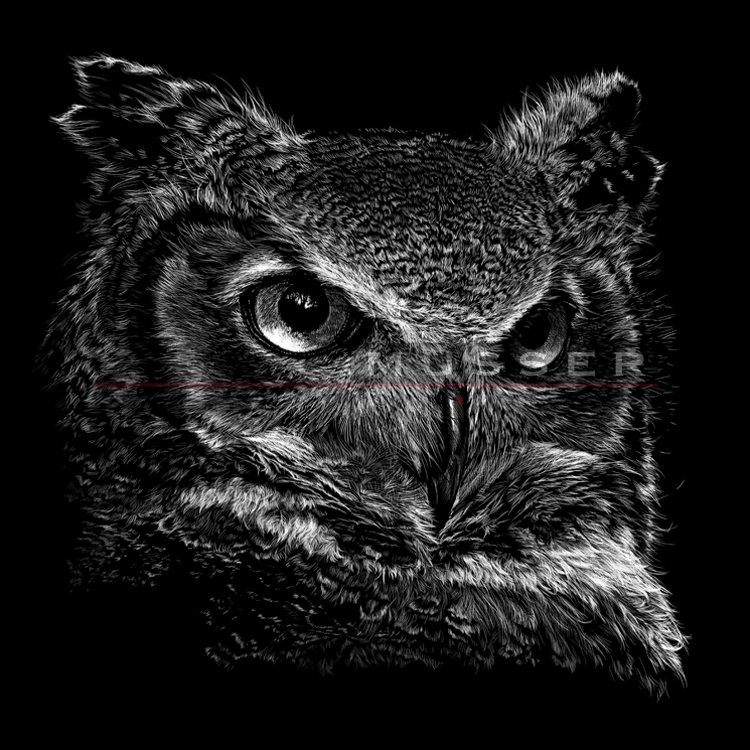 Laurie's "Great Horned Owl" was selected for display out of 131 entries. A total of 31 works were chosen by juror Shari Wilkins for this exhibition and was awarded the Jurors Mention. Laurie will be present along with her most recent works. Framed as well as unframed prints will be available for purchase. Commissions and additional size can be requested. New to this event Laurie will be offering Flour Sack Towels with woodland images!